Earlier in the month Luke Stanke asked if I would write a guest post and workout. As someone who completed all 52 workouts in 2017, the answer was obviously YES! This week I thought I’d take heavy influence from a neat little chart made to accompany Makeover Monday (w36y2017) – the Frequency Matrix. I call it a Frequency Matrix, you can call it what you will – the intention is this: use color to represent the frequency (intensity) of two things. So for this week you’ll be creating a Frequency Matrix showing the number of orders within pairs of sub-categories. 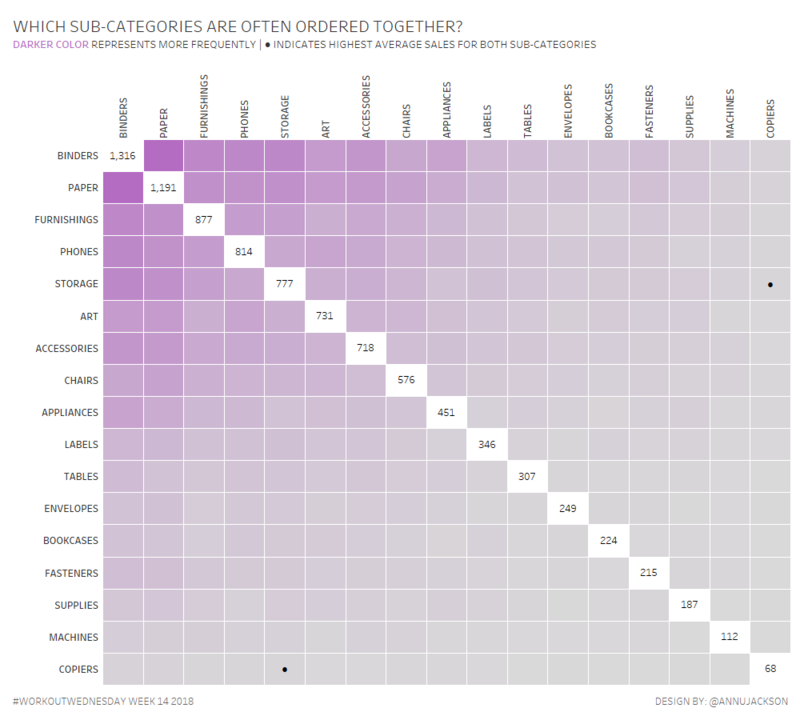 Primary question of the visualization: Which sub-categories are often ordered together? Secondary question of the visualization: How much on average is spent per order for the sub-categories. Tertiary question: Which sub-category combination causes the most average spend per order? Also, don’t forget to track your progress using this Workout Wednesday form.